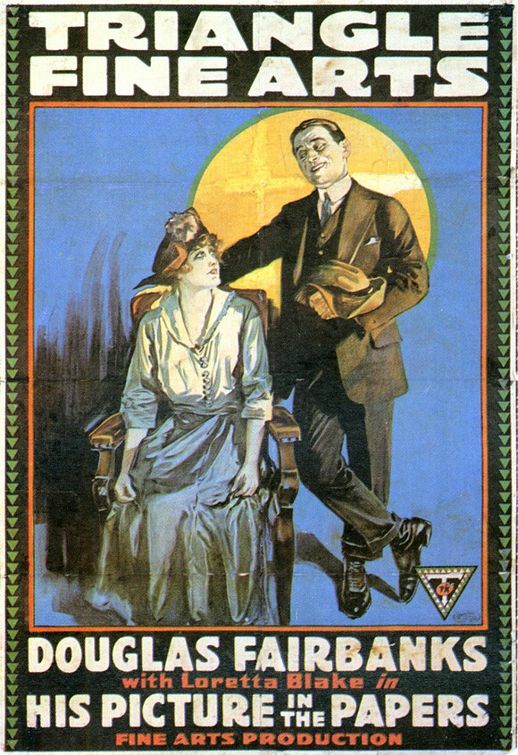 Douglas Fairbanks returns in yet another movie in which he must face unbelievable odds and travel immense distances in order to get married. This one takes advantage of his charm and wit, and occasional doses of his physical prowess, to get a good number of laughs from the audience. Doug plays Pete Prindle, first son and heir of Proteus Prindle (Clarence Handyside), the magnate behind “Prindle’s Products,” a line of unappetizing vegetarian goods. One of Prindle’s “disciples” (and, evidently, employees), is a fellow named Cassius Cadwalader (Charles Butler). His young daughter, Christine, (Loretta Blake) is of marrying age, but she doesn’t seem to like the thin, effeminate specimens he brings home; it’s very important that she marry a vegetarian, you see. Pete and Christine run into one another at a non-vegetarian restaurant and share a steak together – they both share the secret of rejecting their families’ diet. But, when Pete asks to marry her, Cassius tells him he must prove his worth by getting a 50% interest in the Prindle empire, and his father tells him the only way that will happen is if he gets out and gets some publicity for the company. His daughters have managed to get a story in a Vegetarian Journal, why isn’t he in the news, too? Doug’s got an idea. Watch out, world! So, Pete sets out to get himself into the papers. First, he fakes an automobile accident, but only gets a small mention, not a picture. Next, he wins a boxing match, but the police raid it before any of the photographers can submit their pictures. Then, he has the bright idea of telling the papers he was miraculously cured of being an “invalid” by taking a competitor’s product – that only gets dad madder at him. Finally, trying to cadge a dollar for a fortune teller from a buddy in a men’s club, he winds up hungover in his pajamas in Atlantic City and gets into a brawl with some policemen, but his name is withheld. Really, it could happen to anyone! While all of this is going on, a gang of hoodlums (one of whom is Erich von Stroheim, still new to America at the time) is trying to threaten Cadwalader for protection money. Cadwalader doesn’t think a Prindle’s man should back down so he has the police arrest one gang member, and when another one stabs him in the chest he’s defended by his trusty tin of Prindle’s lentils that he always carries. His daughter insists on hiring detectives, so from this point he’s constantly surrounded by four of them. One gang member tries throwing a bomb, but gets blown up himself. Now Prindle orders him to go down to Atlantic City to check on a shipment of Prindle’s Products that got delayed, and the gang devises a plan to crash his train. Of course, Pete is walking along that very line, and catches sight of a railman they’ve disabled in order to pull the switch that will crash the train. Without knowing who he’s saving, he heroically dashes in and fights off the gang, finding the missing railroad car and using Prindle’s Products as weapons. The next day the headlines trumpet his saving one thousand people and capturing the crooks. He and Christine kiss behind a paper. It’s interesting to note how often Doug plays the spoiled son of a wealthy man (even in “The Matrimaniac,” he’s rich and unmarried, although we never see his father) who has to make good somehow. 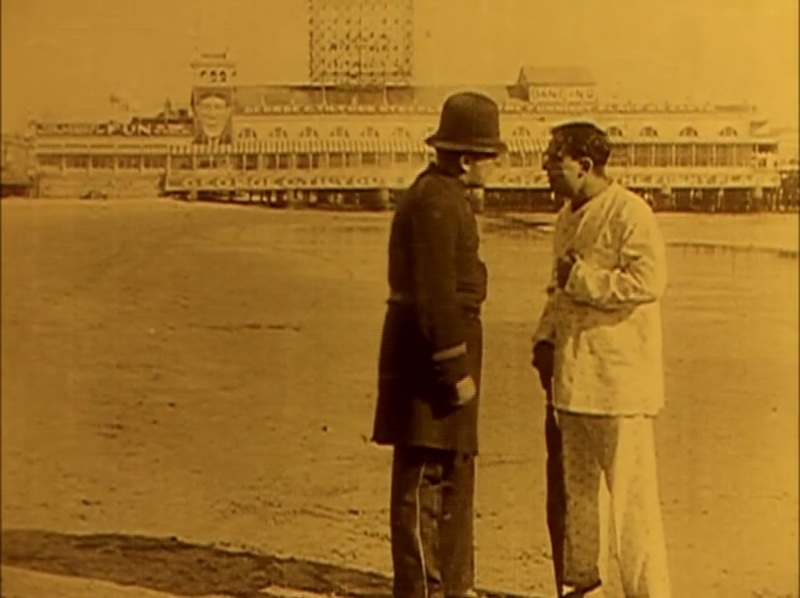 I’ve really come to enjoy the style of humor of these early Douglas Fairbanks movies. 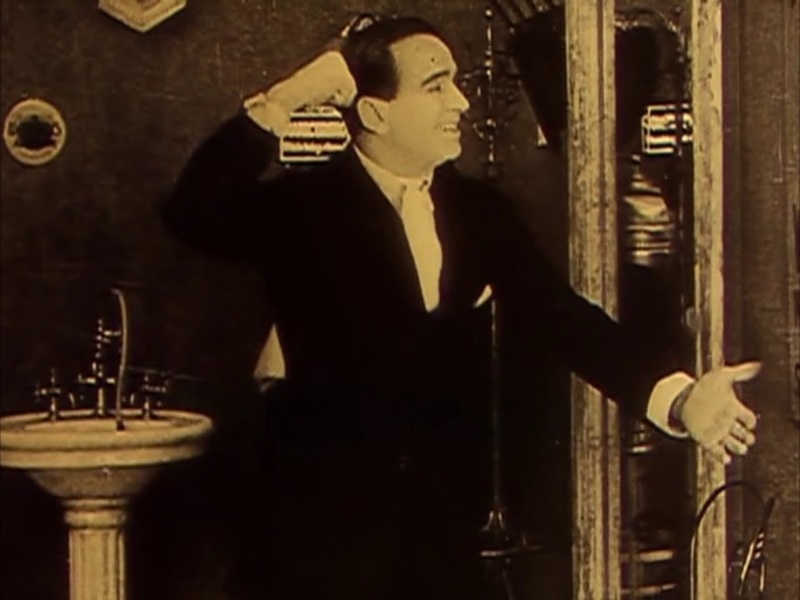 In this case, the intertitles are the source of much of the humor, but they seem to match up with the wry grins and attitude of Doug himself. A lot of the humor is at the expense of vegetarianism, which actually makes it seem more relevant today than a lot of century comedies (remember, vegetarians, these products have come a long way in 100 years!). Doug climbs up a building to visit his sweetie’s balcony, and he also boxes, wrestles a goat, beats up two policemen, and swims ashore from a cruise liner. At one point, he is thrown off of a train because his ticket apparently specifies that he is a “fat man with whiskers.” That’s why he attacks the goat – he needs the whiskers! 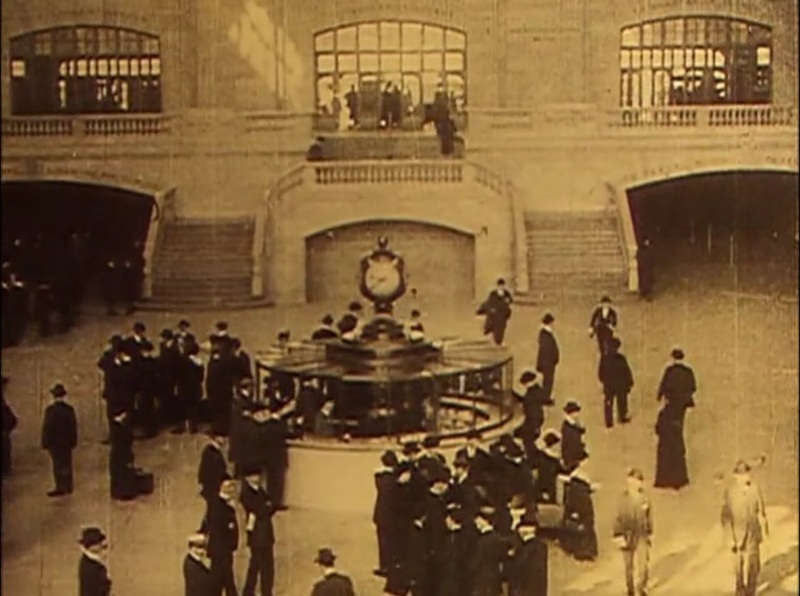 Much of this movie was shot in Fort Lee, New Jersey, but there are some recognizable shots of New York City (especially Grand Central Station) and the Atlantic City boardwalk (the one the property in Monopoly is named for!). There is good editing and shot composure, and a strong use of close-ups. 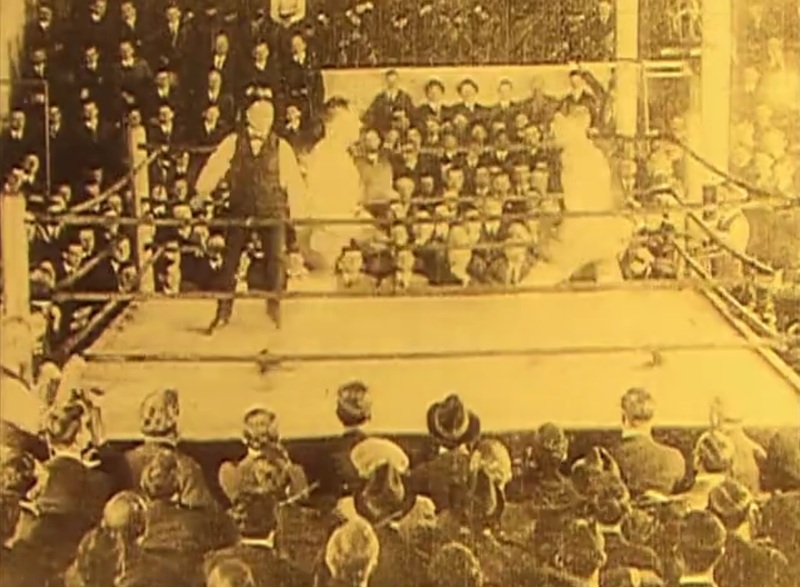 The one scene that puzzled me was the boxing scene, which looked like it had been shot for Edison in 1896. The camera never moved, there were no cuts, and the whole fight was shot at such a distance that I couldn’t tell the boxers apart. Overall, it’s a very enjoyable movie, and the Flicker Alley version comes with a lively score by Frederick Hodges. You can watch it for free: here (no music). For music, head on over to Flicker Alley and rent it, cheap!